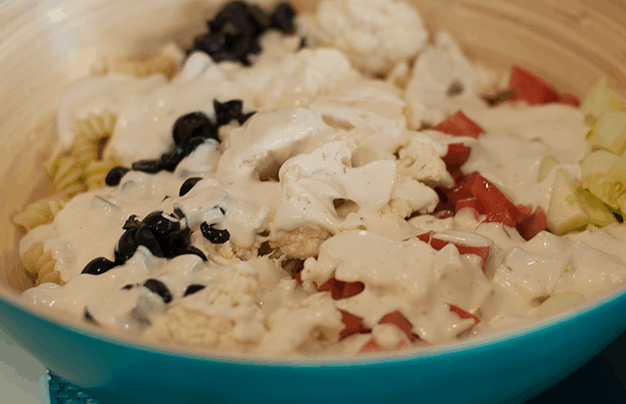 The best cauliflower ranch summer salad recipe. Great for BBQs and potlucks. 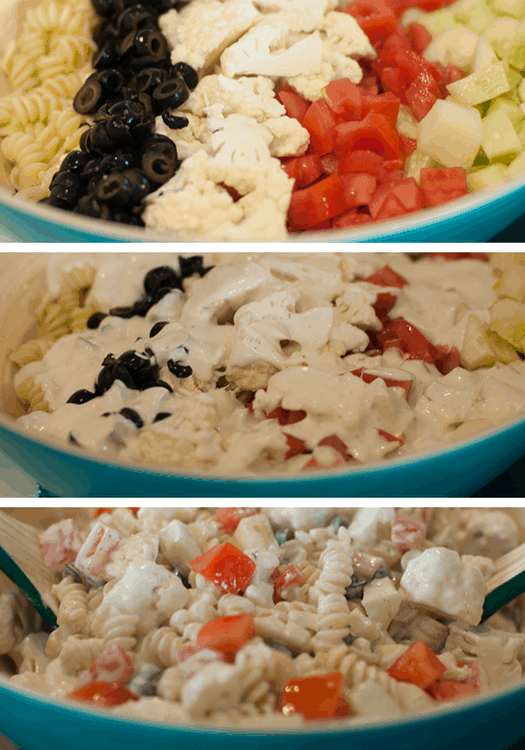 Spiral pasta, cauliflower, olives, tomatoes, cucumbers topped with ranch dressing. Hello and welcome! 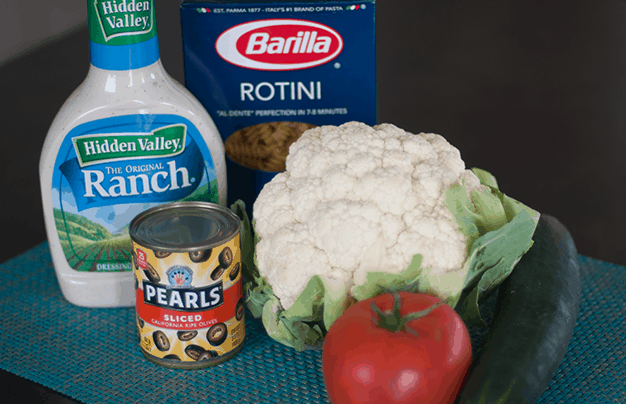 Today I’m sharing a family favorite cauliflower ranch summer salad. Cauliflower is really popular right now — cauliflower “mashed potatoes,” cauliflower mac and cheese, cauliflower fried rice and so much more. 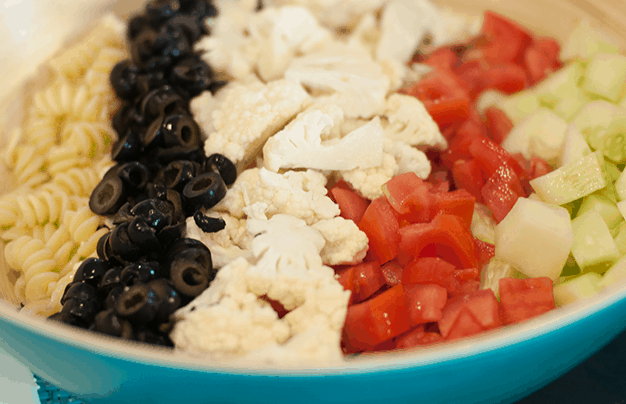 Try this delicious cauliflower side salad for your next BBQ or potluck. Our family typically makes this dish for larger gatherings — graduations, family reunions, wedding rehearsal dinners, etc. It is so tasty! The recipe I am sharing is enough for a small get-together or potluck. However, for larger gatherings feel free to make a double or triple batch. It’s a refreshing alternative to the Italian summer salad (pasta, Italian dressing, cheese, olives, etc.) and not to mention — it is loaded with veggies, yum!! Plan for it to take about 25-30 minutes to make – chopping veggies, cooking and cooling the pasta and adding the ranch dressing. It serves about 12-14 people. 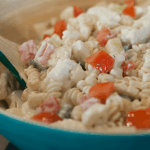 Start by cooking half of one box of spiral pasta salad — using the directions on the box. I normally buy a 1 pound box. Rinse with cold water — you don’t want the pasta to be warm when adding the ranch dressing! Chop the cauliflower into bite-size pieces. Remember to wash your veggies! Dice the cucumber and tomato into chunks as seen below. Slice the olives (if you didn’t buy the pre-sliced canned olives). Add the pasta, cauliflower, cucumber, tomato, and olives to a large serving bowl. Mix in the ranch dressing. I typically use about half of the bottle — just enough to coat the salad. To mix things up, you can try using a Greek yogurt and dry ranch seasoning packet mixture for the dressing instead of the bottled ranch. Or try mixing sour cream and dry ranch seasoning. Here is the teal bamboo bowl I use and love! 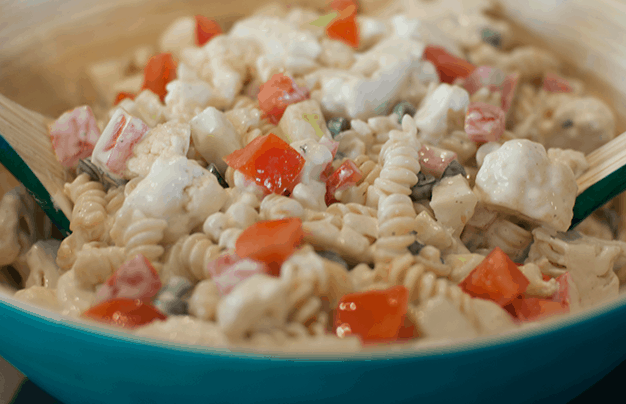 Refreshing cauliflower summer salad with pasta, cucumbers, tomatoes, olives and ranch. Slice the black olives (if not already pre-sliced out of the can).